Kellogg’s Froot Loops is the latest food brand to offer brand-themed apparel. To develop the capsule collection, Froot Loops collaborated with AwayToMars, a U.K.-based “co-creation” platform. The platform solicits designs for specific fashion campaign concepts and hones concepts with the input of its online community. According to the site, it shares any profits with the designers and community members who contributed to items that are produced and marketed. 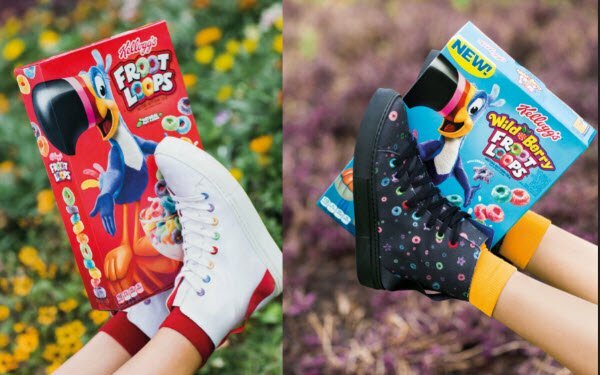 The 10 items in the Froot Loops collection, debuting today at awaytomars.com/frootloops, include sneakers, hats, tops, shirts, dresses and outerwear inspired by the shapes and color palettes of the cereal (including its recently launched Wild Berry flavor) and its mascot, Toucan Sam. Prices range from $30 to $185. More than 700 people contributed to the designs, according to Kellogg’s.